So far the sneak peeks for CaseDetective 1.1 haven’t been all that enthralling, even I am able to admit that the features I’ve shown aren’t that big a deal to most users of CaseDetective and FogBugz. 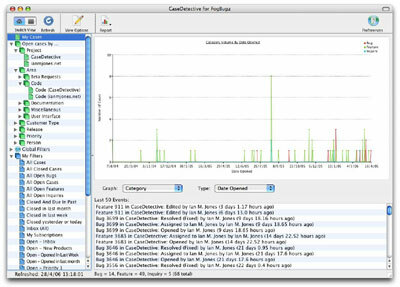 The above graph was grabbed from the new “Overview” pane, which includes the previously sneak peeked Last 50 Events list. To be able to include graphs of statistics from FogBugz in your reports, all you have to do is select an appropriate filter and pick the type of graph you want, then simply copy and paste the graph into your report. It’s as simple as 1-2-3! And as you can see from the above screenshot (click it for a better view), when you hover your cursor over a “node” you get a little yellow pop-up with a bit of info about it, such as the number of cases (Y value). Being able to quickly see patterns in your FogBugz data through graphs and charts in CaseDetective for FogBugz should hopefully help a lot people get through their day that little bit quicker when it comes to getting those reports out. Posted by ianmjones at 1:48 pm on April 28th, 2006. Yep, you read the title correctly, I’m looking for a contract. Although the next release of CaseDetective is nearly ready for private beta test, I’ve recently had a bit of financial bad luck come my way in the form of a tax bill that means I need to start earning some dosh much quicker that CaseDetective alone can (or ever will I suspect) manage. I always knew that CaseDetective was going to be a bit of a slow burner, and thought I had enough money in the bank to last a full year without even a penny coming in, but this tax bill was larger than expected and has basically wiped out my business account. Personal finances are still fine though, we’ve got plenty of money in our personal accounts to last us the rest of the year as planned, it’s purely the business account that has got a bit low when I’d expected it to stay pretty static apart from the last couple of VAT bills and my ongoing wages coming out. Alas, I hadn’t planned on last year’s corporation tax for the dividends I’d taken, and had forgotten just how well I payed myself two years ago! So, it’s back to contracting I go, if I can get one. Because I have extensive Informix 4GL/SQL/SPL experience over the last 10 years, obviously I’m looking at contracts in that skill set first, it’s always done me well, and without blowing my trumpet too much, I know I’m pretty darn good at working with Informix. It’s unfortunately pretty slim pickings out there for Informix 4GL development though, so it may take some time to get a contract in that area. I’ve now had approx 2 years experience with REALbasic too, and I’m keen to see if I could pick up some work that requires it or could be accomplished with it. If I had better local business contacts I’m sure I’d be able to find lots of little companies looking for custom applications to be developed, that would be a nice way to make some extra cash now that the big stuff for CaseDetective is done. I’ll have to look into this a bit more if I can’t get a full time contract. I may expand the IMiJ Software brand to also accept custom development projects and small contracts over the internet, I’m sure there’s a huge number of companies small and large out there that need that one little app built to fix that chink in their process, and with REALbasic and my many years of business and systems analysis I could no doubt meet their requirements on Windows, Mac or Linux in short order. There are a few companies and individuals out there that advertise custom development with REALbasic, I’d be interested to hear how well they are doing, and whether they are getting plenty of work to keep them busy and in profit. I guess it goes without saying, but I’m going to say it anyway, if you know of anyone looking for a bit of development done and is looking for someone talented, efficient, thorough, personable, handsome … Well, you know where to send them … no, not somewhere else smarty pants, to me! Anyway, enough of the rambling, must get back to finishing up those last couple of small things on CaseDetective that seem to be taking forever, and I promised someone I’d post a sneak peek this week of a new feature that I think will help them out a lot, so I’d best be off for now. Oh, and before I leave off, just to confirm that I’m still developing CaseDetective and have no plans to stop doing so. I have a list of features as long as an Orangutan’s arm that I and my customers want implemented, and I will do so as quickly as I can. 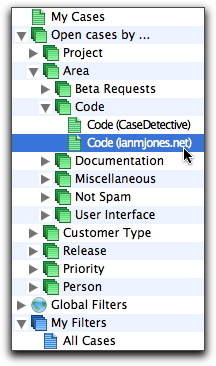 CaseDetective will continue to be developed and supported, it’s still a huge part of my long term plan to become primarily a developer of software for the masses, as are other projects I have in mind for the future of IMiJ Software. Posted by ianmjones at 11:44 am on April 28th, 2006. This post was originally a guest post for the Fog Creek Blog, but I’m re-posting it here for completeness with permission from Michael. There’s a neat little new feature hidden away in FogBugz 5 (currently in beta) that I think a lot of people will find useful (and not just because I asked for it), HTML anchors on displayed bug events. A few months ago there was a feature request on the FogBugz discussion forum that I thought was pretty good, so I nicked it for CaseDetective (thanks Sam Chrisp)! The feature request was for a “Recent Activity List”, basically a listing of the last X number of edits and comment events so that the FogBugz user could see what has recently happened, and then click through to any Case that’s of interest. The feature request even included a picture of the list that the user had created for themselves by modifying the FogBugz code. I liked the idea and felt it would be useful as long as you could click on an event line in CaseDetective and go directly to the FogBugz edit entry in the Case view page without having to scroll down the page to it. 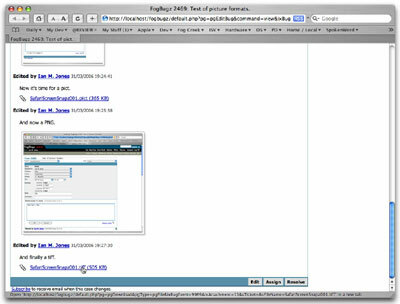 There was one snag though, FogBugz 4 didn’t have any HTML anchors on each of the entries in the view page so CaseDetective couldn’t construct a URL to go directly to the entry. Darn! 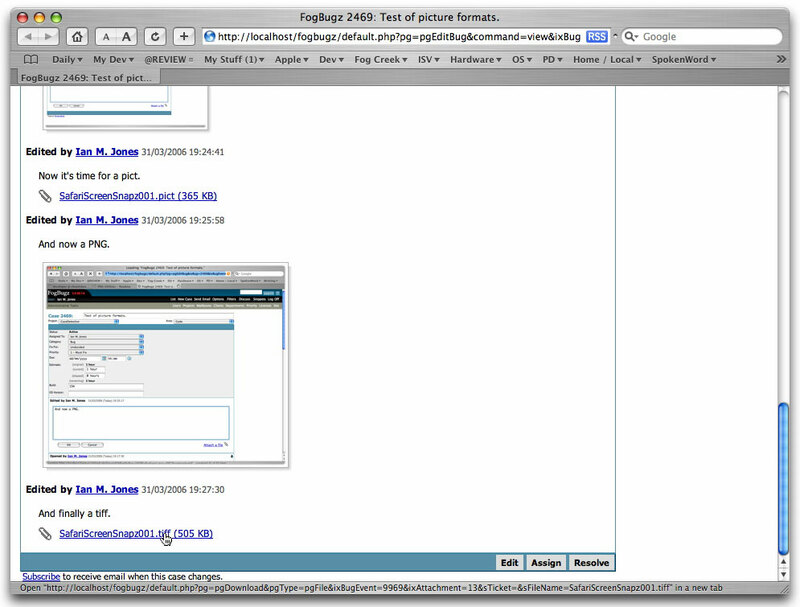 So I fired off a quick email to Michael (Pryor, I think you all know who he is ) asking whether he’d consider adding anchors to the view pages in FogBugz so that anyone could construct a URL to go directly to the event. Michael said he’d pass it on to the development team for appraisal. The announced features for FogBugz 5 didn’t mention anchors so I thought I’d missed the boat and would have to wait a little while before implementing my Recent Events list. However, while playing with the FB5 beta late one night (make that early one morning, just couldn’t sleep until I found out everything that was new) I checked the HTML source for the Case View page and there they were, BugEvent anchors. Yeehaa! Here’s the deal, every bug event that is displayed in a Case has an anchor in it’s header, something like “<a name=”BugEvent.9969″>”. As long as the URL ends with a “#” followed by the anchor’s name, you should be good to go. “Please look at this comment: <link>” and past in a direct link to the comment. This event list will make up the bottom half of CaseDetective 1.1s new “Overview” view, which I’ll discuss a little more on my blog soon. 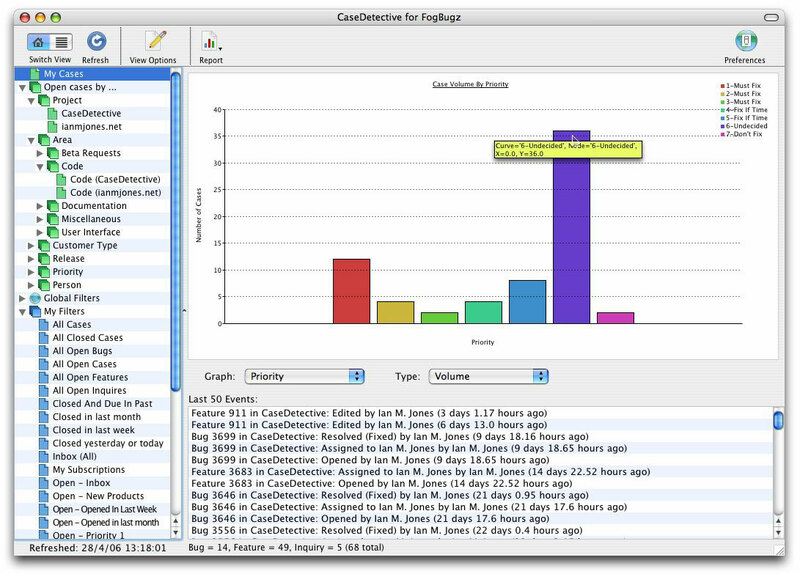 CaseDetective 1.1 is still in development, but we’re working hard on getting it into your hands as soon as possible. Stay tuned for more updates as we get closer to release. Posted by ianmjones at 1:25 pm on April 7th, 2006. In FogBugz there is this concept of a Project Area. Areas are usually something like “Code”, “Documentation”, “User Interface” and so on, a way of categorizing a Bug, Feature or Inquiry so that the correct person can pick it up. They are very useful, a great way compartmentalizing you Cases for better resource and time management. 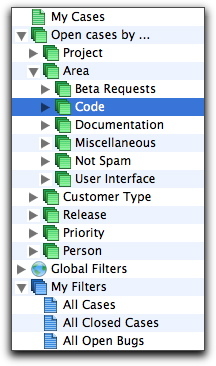 The problem is, these Areas are children of a Project, so it’s impossible to create a filter in FogBugz that captures all cases that are in an Area regardless of the Project they are in, for example; all Cases related to “Code”. This is a real shame, as many people use Areas for all kinds of things, and would love to see all cases that have the same Area. Some people think of Areas as a kind of tag. 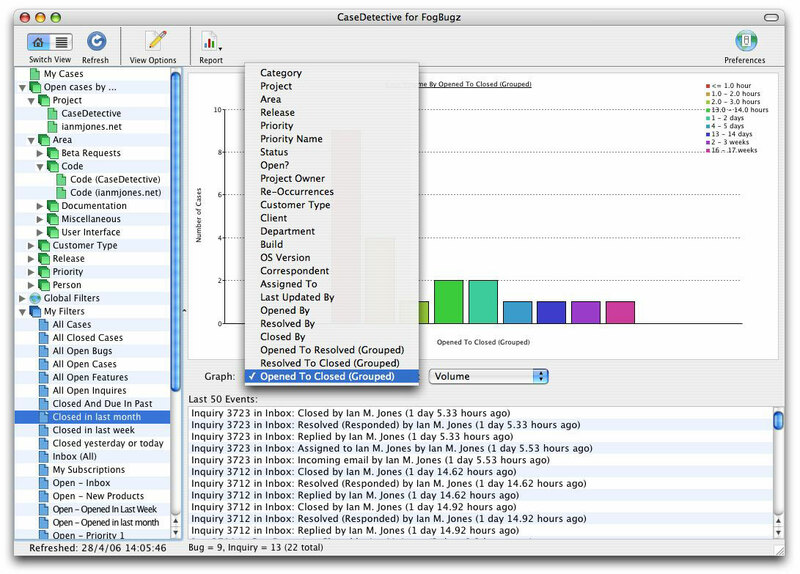 In CaseDetective 1.1 for FogBugz we’ve opened up Areas a little by giving you a “Open cases by Area” summary filter, allowing you to see all open Cases in each of your Areas, regardless of the Project they’re in. 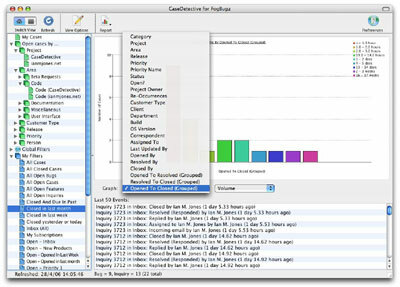 But, if you then need to drill down to find out which Projects those Cases are in, you can. Some way of seeing all cases in an Area name without having to select a Project has been one of the most requested features I’ve seen, and something I’ve long wanted myself. Posted by ianmjones at 12:41 pm on April 4th, 2006.